I’m having a hard time thinking about anything other than how cold my office is. I sit right under a vent and it is blowing icy air right now. I honestly couldn’t tell you WHY the air conditioner is on when, according to my Weather Channel Desktop Icon, it is 78 degrees outside. I think 78 degrees is pleasant and NOT a temperature that requires Freon. Just saying. The only way I can warm up is to wrap myself in fleece blankets and drink my 807th cup of coffee. Anyway. 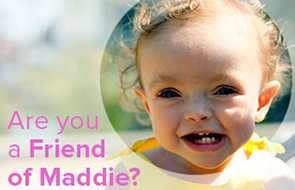 Maddie has been having lots of fun with The Babysitter (a.k.a. Grandma) while I’ve been slaving away at work. Today they went on a walk to pick up Rigby from the groomer. Rigby and I both get our hair cut every six weeks or so. It’s one of the luxuries we allow ourselves as women. Rigby has fans at the groomer – when I called to make her appointment, the woman on the other end of the phone said, “oooooh! My Rigby! She’s so snuggly!” You don’t find too many groomers that take the time to snuggle your dog, so this place is definitely a keeper. Although, snuggling is not normally one of the services they offer…they found out the hard way that if Rigby is locked in a cage, Rigby is not happy. If Rigby is not happy, Rigby will bark. And it’s not just any bark, it is the special kind of bark that only small, irritating dogs posses. High pitched and incessant, it makes your ears bleed and your brain explode. When Rigby gets on a barking jag, one wishes for the sweet relief of death. Luckily, it is easy to make her stop – just pick her up. Then she’s happy as a clam. Don’t get me wrong, Rigby is far from irritating in all other aspects. She just has some owners that did a crappy job training her in the manners department. 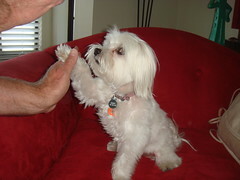 She’s really cute when she high-fives, though!!! When Maddie and my mom picked Rigby up, my mom engaged in her favorite pastime – showing off her granddaughter. Somehow my mom found out that the owner of the grooming place also had daughter who was born premature. So she was abnormally thrilled to fetch Rigby and show the nice man her abnormally tiny granddaughter. My mom said that everyone at the grooming place gathered around Maddie’s stroller to look in at her. Maddie silently looked back at all of them and then, when the moment was right, smiled back at them. Melting by all ensued, free dog biscuits were offered (to the dog, not the baby). I’m so proud my daughter has already figured out that being cute gets you things. Someday she’ll use that smile for free drinks (but not for 21 years, of course) and dinners from boys. 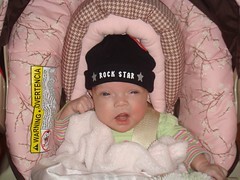 Until then, she’ll just be my little gangsta.